When I was a child there was a sketch comedy TV show for kids – Yeralash. One of the episodes was titled Twins (it’s shorter than 2 minutes – start at 4:00 – you can watch it for the idea, I didn’t find it with subtitles). The plot: Two little boys (LBs) on a sled bump into an older boy (OB). He gets up to confront them when he notices that they look alike. LBs (here and later they speak in unison): We are not identical twins! OB: What do you mean “not twins”? Are you brothers? OB: Then you’re identical twins! LBs: No, we told you, we are not identical twins! OB: Were you born the same day? OB: Then you are identical twins! LBs: No, we are not! OB: Why are you messing with me?! Let’s do it again. Were you born the same day? Are you brothers? Are you look-alike? OB: Then you are twins! (the third little boy who looks exactly as the first two comes from behind and pushes OB away): Leave them alone! We are identical triplets!!! I went to pee! A year ago in one of the department stores I came across a stand with six or seven classic Guerlein fragrances. It was my first close encounter with those perfumes and since the only one I tried before – Shalimar – didn’t work for me I was reluctant to put anything on my skin. So I spent some time with all those bottles and paper strips. Have you ever tried keeping six unsigned blotters in order? I thought I was doing fine… Later, as I was going through those blotters in the car, the scent from one of them suddenly felt very familiar. A couple of minutes of intense sniffing later I conjured the answer: Estee Lauder’s Tuscany per Donna! The problem was that I didn’t know which perfume it was: blotters mixed in my hands and names did the same in my head. I came home and went through the notes lists for those perfumes I suspected might be “it” – Mitsouko, Jicky, Jardins de Bagatelle and L’Heure Bleue. Each one of them had a potential but I couldn’t tell which one it was just from comparing notes. So the next week I went back to the store and sprayed those perfumes on new blotters (signed this time to avoid confusion). Nothing. None of them smelled like Tuscany per Donna. Since all that happen soon after I published the first episode in my o Déjà vu category I concluded that it was a wishful thinking on my part and thus wrapped up my experiments. During my Guerlain Quest in Las Vegas this February, following Suzanne’s recommendation, I tested Samsara in parfum concentration. I smelled it from a blotter that an SA handed to me and immediately thought of another perfume Samsara reminded me of. Actually, I thought of another two perfumes. But remembering reaction of the Specialist (I won’t repeat the link but you might want to look through the story from the Episode 1 linked above to understand what I’m referring to); I chose the “more niche” of two to mention to that SA. I told him that Samsara reminded me of Frederic Malle’s Iris Poudre. And that was where it was “déjà vu all over again”: his reaction was really similar to the one I got from Malle’s Specialist. I thought it was ironic. – Are you wearing Tuscany per Donna? – I asked. – No, it’s Samsara – she answered. Based on my first tries of each of these perfumes, I agree that they are similar. Yet I can readily identify differences between each of them. Red (Iris Poudre) smells more “modern” to me than Blue (Tuscany per Donna) or Yellow (Samsara) – more like something that would be coming out on the market now. Yellow is quieter and closer to the skin than Red or Blue. Blue is the most assertive, classic, and sexiest, as well as the most animalic – it’s the one I’d want if I had to buy one of these perfumes. It’s the diva of the trio. Recently I tested all three perfumes – Tuscany per Donna, Iris Poudre and Samsara (both parfum and EdT) several times. Having five notes in common for all three (rose, carnation, jasmine, sandalwood and vanilla) and additional 2-3 between the most note-rich Iris Poudre and each of the other two, these three perfumes are distinct. I can definitely tell apart my favorite Iris Poudre: after more than a year of wearing it repeatedly I do not think any more that it’s identical to Tuscany per Donna. Testing Samsara and Tuscanny per Donna in parallel I can smell the difference. But all three have so much in common, especially on some stages of the development, that I’m not sure I won’t mix them up next time “in the wild” (©Dee, I think). Tuscany per Donna, Iris Poudre and Samsara are not identical triplets but definitely fraternal ones. Read Suzanne’s (Eiderdown Press) real (and very beautiful) review of Samsara and Iris Poudre; Victoria’s (Bois de Jasmine) very informative article on new and vintage Samsara; Elisa’s not a review but an interesting layering idea for Tuscany per Donna and (thanks to Suzanne’s comment) Meg’s (parfumieren) review of Tuscuny per Donna. This entry was posted in Déjà vu, Favorite Perfumes, Not a Review and tagged Estee Lauder, Frederic Malle, Guerlain, Iris Poudre, Samsara, Tuscany per Donna. Bookmark the permalink. That was a cute clip of the triplets! If you go for Samsara, try to test the parfum version. As for the Tuscany per Donna, it’s still a current scent (probably re-formulated but still recognizable) so it shouldn’t be hard to find a tester at any EL counter. You know, I don’t know if it’s my faulty memory (or nose) but I often think when I smell a perfume it reminds me of some other perfume I smelled before (just yesterday happened with Eau de Chloe). When I get to compare some of those, I can smell the differences but generally speaking, they fall very close to each other in my mind. Ines, you described it perfectly! Scents in memory are slightly distorted. And these three smell much more alike when not tested in paarallel. When I smelled Eau de Chloe recently I also thought it reminded me of another perfume. But I couldn’t pinpoint which one. Undina, oh darn! I wish so badly that I still had both my Samsara extrait and Iris Poudre left in my decants stash, because now I want to smell them together, but I’ve used up every last drop of both. You know what’s funny, reading this? I have a memory of not liking Tuscay per Donna at all, and when Meg of Parfumieren reviewed it some time ago, I wrote that even her review could not make me want to smell it again. (Insert embarrassed smiley face.) Well, now I’m going to have to eat my words and order a decant of it (as well as more Iris Poudre and Samsara) because if you’re right — and I know you probably are — I should be loving the TpD!! Perhaps my memory of it is faulty, as I haven’t smelled it in ages. At any rate, now I’ll be seeking it out so I can do this comparison. Thanks for another fascinating deja-vu discovery! Suzanne, thank you for the information – I found Meg’s review and updated my post with a link. I didn’t find it when I searched Google. I think that TpD is a beautiful perfume regardless of if it smells like anything else or not. Though it is an oriental-floral perfume so I’m not sure if it has enough sandalwood and amber to offset its “floral-ness”. Ah! Dear Undina, thank you for including me in your blind testing! I meant to send you a bigger writeup but I have been so busy… here are a few more thoughts. I will say I noticed commonalities between all three perfumes. Iris Poudre has a fresher, fruitier top than the other two. It almost read as citrus to my nose (does it have citrus??). With Samsara EDT I find the drydown to be less similar… there is the obvious sandalwood drydown. However, the middle does have commonalities, with a warm musky powderiness and some of the floral notes. Honestly, “warm musk,” and perhaps certain shared floral notes seemed to me what these three had in common. I find it weird/slightly embarrassing that before I opened the card my brain never really connected “powder” with these perfumes. Perhaps what my nose is reading as “warm musk” is the powder? I thought all of them were delightful and pretty much up my alley. And I really think I’m going to get the Tuscany. I find it hilarious that I think it’s so much better than the other two, more expensive, perfumes. Another perfume these three actually brought to mind for me is Mona di Orio Musc, which shares a delicious warm musky powderiness with them. I just checked her website and it describes Musc as a “powdery floral musc.” My nose is not a total failure, apparently, even though I can’t identify powder! Notes for MdO Musc are Neroli, Angelica, Rose, Heliotrope, Absolute Tonka Bean, Precious Musks. I would be really interested to see if others find it similar to the other three, too. Susan, once again, thank you for the participation. I feel slightly better now when somebody else confirmed that there is at least some similarity between these three. When I have a chance I’ll try Mona di Orio Musc – I’m curious. This was a lot of fun to read, Undina, as you know I love Samsara extrait (and thanks to BdJ’s guide also the ‘vintage’ edp) I had never thought of TpD, and the title of the perfume *is* a bit off putting, why ‘per donna’, but not ‘Toscana’? If people know what per donna means, surely they know that Tuscany is Toscana? Or just call it Tuscany for women and be done with it… (mini rant over ;-)) And very embarrassing that I didn’t even try IP, but so far I had no luck with Malles, so I suppose that one had to wait its turn, but you seem to have said the magic words. It started with Aramis naming their perfume Tuscany per Uomo. Then they had a counterpart perfume – per Donna. I’ve never thought about the name twice. Tuscany per Donna was the first perfume I bought when I moved to the U.S. so it holds a special place in my heart. But Luca Turin also thought it was good! And Meg! Just try it and see for yourself if it works for you. I already checked but, as I thought, it’s not available here, Estee Lauder is a very US brand, perhaps that’s why? Thanks for the explanation, I like words, so something like that instantly hits me as disjointed. This deja vu feeling can be quite haunting when it comes to fragrance. For me Tuscany Donna smells a lot like Balmain Ambre Gris. What are you doing to me?! :) Now I’ll have to compare this one as well. Good thing is I have a sample already just haven’t found time yet to try it. I enjoyed this tale of non-identical “triplet” scents very much, not least the funny opener about the missing LB! I am only familiar with Iris Poudre out of that trio, which I like in winter especially, but should refresh my memory about how Samsara smells, because it is a classic, albeit one that has been tinkered with down the years. I am forever comparing scents to one another in my head – in my case it may be because I struggle to deconstruct perfumes into their individual notes, but fare better saying that they remind me of this or that, whether just a particular facet, or the overall effect. I’m the same! I’m not too good at picking out notes (and when I do, every time I feel like I won a small lottery) but I find similar accords and general resemblance. I used to love Yeralash! And I remember this skit really well. Thank you for a laugh. I didn’t think about it before, but Iris Poudre does have something Samsara like about it. Just put it on after reading your post, and I’m enjoying the warm woods. Now, I need to smell Tuscany Donna. Oh, I just remembered this one! It’s hysterical. a boy invites a girl to the theater…. You have inspired me to test these triplets in parallel, too! I think it’s impressive how you can sort out the dominant notes and focus on the “supporting players” to identify what these fragrances have in common with others. I need to re-try Samsara if it’s anything like Iris Poudre. I am definitely misremembering it from so many years ago. 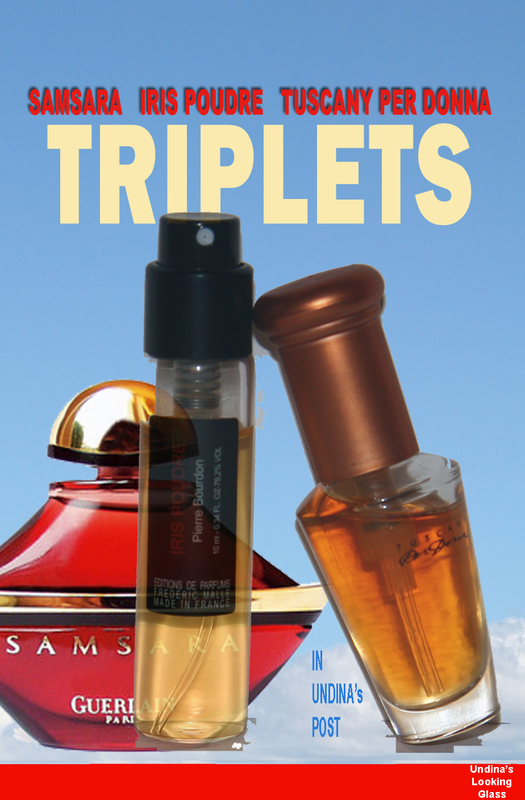 And now I want to smell the third “triplet” as well. I love these posts from you, as you know. I want to support your “no perfume buying” initiative: if you do not have access to Samsara at a store I can send you a sample of the EdT. First – I’m glad that you had a chance to re-visit TpD. Second – you should wait for more Irid Poudre ;) and try to compare some of the stages. Top notes now are really distinguishable for me but still on some stages I can smell similarities. Thank you for the link, Undina! It took me a week to run across it because I’ve been traveling. Recently, I wore Tuscany per Donna to the grocery store, and a man approached me and asked if that’s what I was wearing. I was impressed with his nose! He told me that his first girlfriend wore it. Very sweet. TpD has a tendency to go off. I had a couple of partial bottles pronounced unusable at some point – and they weren’t abused in terms of storage! So be very careful with the vintage version of this one. I love that you do the ‘twin thing’ too. I used to do that a lot and I’d always pair scents that nobody else did which made me think something was wrong with my nose. It is interesting that you compare Samsara and Iris Poudre. I smelled these two scents at two very different times but liked both of them. Samsara was the first Guerlain I liked. In fact it was the only Guerlain I liked for a long time but it always seemed like a ‘lesser Guerlain’ on perfume blogs which again made me question my nose (this was way back in the beginning so I was less confident about my nose..:)). I might finally get my hands on some vintage juice so I will compare IP and Samsara. Lavanya, you are my dream reader! I feel so bad when I realize that some of the friends I got in the last, lets say, year will probably never read some of my favorite posts – just because those were published “before their time.” And I feel happy every time one of them finds something in the older posts that prompts a comment. With more experience sniffing different perfumes I started smelling more nuances and now I come across similar perfumes less. But I still find them from time to time. So maybe the next time you’ll participate in the comparison experiment. If you want with the next package I’ll send you samples of any of these three if you don’t have them.